Rush is a period of time where you can acquaint yourself with all the organizations offered on GMU campus. Kappa Phi Lambda holds a series of social, cultural, and informational events during this time. We provide an opportunity for you to get to know the sisters in a relaxed environment and ask any questions. There are no obligations or commitments during rush, and best of all everything is FREE! Absolutely NOT! There are several different nationalities represented among Kappa Phi Lambda nationwide. 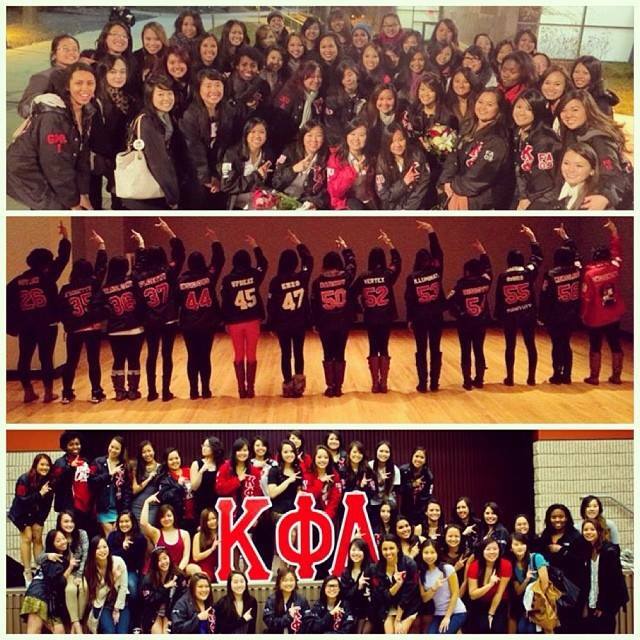 We stand as a cultural sorority that promotes sisterhood, service and cultural diversity. What is a bid? and How do I get one? After the end of rush, we give out bids, which is our invitation to you for the next step to join the sorority! To be considered for a bid, you need to attend at least 1 General Interest Meeting and at least 2 rush event (see rush flyer for dates). If you receive a bid, you have 24 hours to consider it and come back to us and tell us whether or not you'd like to take the next step, the intake process! The new member process helps you to learn more about yourself, your line sisters, and the sisters of Kappa Phi Lambda. In accordance with the GMU and Kappa Phi Lambda Sorority, Inc. regulations, we do not engage in conduct resulting in recklessly or intentionally endangering mental or physical health. Furthermore, we do not believe in forced consumption or alcohol or drugs for the purpose of initiation into or affiliation with this organization. Will the new member process affect my grades? Kappa Phi Lambda always puts academic excellence as a first priority for both new members and sisters. Our colony Academic Advising Chair monitors grade fluctuation and ensures GPA requirements are met. With over 30,000 students on campus, over half of them commuters, it's all too easy to join one club and float through four years without really accomplishing something other then a diploma. Our organization offers the opportunity to make life long friends as well as meet new people from other organizations inside and outside of GMU. We are known for our tight-nit sisterhood amongst our colony as well as on a nationwide level. Aside from sisterhood, Kappa Phi Lambda provides a long-lasting impact in the community through service, philanthropy and cultural awareness events. This organization gives an opportunity to build leadership and time-management skills that will prove invaluable in the future-and with over 1,800 sisters nationwide, we help establish a strong network for your future career.